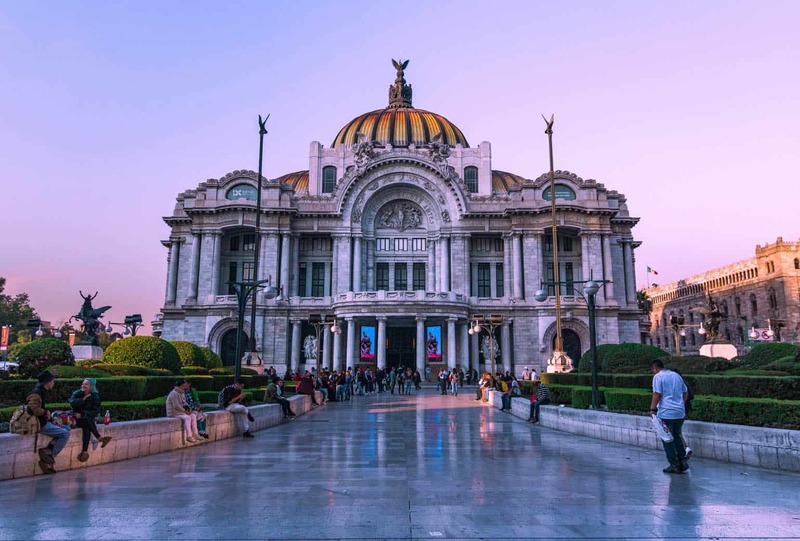 The smell of fresh tortillas and chopped cilantro filled my nose, taxis whizzed by with a honk of their horn and the rich mix of old Neo-colonial and modern buildings ravished me on my arrival to Mexico City. And I was immediately diggin’ it. Mexico City is an intense place to be, which can sometimes be a good or a bad thing… For me, it was great. The city has a vibrant vibe that permeates—the energy is felt throughout, the love for the culture is seen in the eyes of the locals, and the food… the FOOD! Is Indescribable. This high-octane metropolis intrigues any visitor willing to scour its sidewalks, alleyways, and barrios. Mexico City is known as the sun of the country and it’s no surprise as to why. We see you shining Mexico City, we see you. I hope to go back soon, and with a Mexican-American boyfriend with tons of family in Mexico, I’m sure I will! Until then, here’s exactly what I did as an intro with only 3 days in Mexico City. Let’s roam around Roma and take a little boat ride, shall we? This was such a fun start to my 3 days in Mexico City! OK, don’t be disappointed when I say I can’t tell you what to do here. After all, this is Mexico City’s coolest neighborhood. It’s in the process of getting majorly gentrified and while it’s not fully fancy and showcases its dashes of scruff, it’s safe and beautiful without being pretentious! We loved Roma Norte and our Airbnb was just next door in Roma Sur. So we spent the day wandering the streets, getting lost, and eating. A lot. Again, I can’t tell you specific things to do and see and there isn’t anything specific. Treat yo’self to a taco. Today. And everyday. I just like to get lost and get to know neighborhoods without having an exact itinerary of places to hit up. The street art, the cute cafes, the parks, THE FOOD… This is what we enjoyed. I didn’t bother much with maps and name taking, I just strolled. 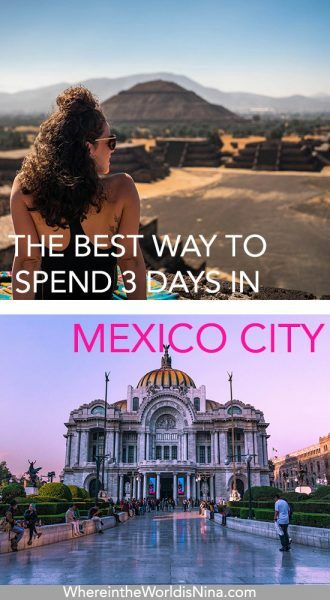 Which is literally the best way to get to know Mexico City in 3 days or any city for that matter. Of course, if you’re a big shopper or a museum-goer—you’ll find plenty of that here but that’s not my thing. However, you definitely need a street taco every day today, yes, need, it’s your first day! How is getting a street taco not the first thing you do? Go get one. Xochimilco was actually quite the treat. We escaped the city and floated into a magical Mexican trance for an hour. Boats inundated with slightly obnoxious decor and splashes of greens, reds, and yellows, mariachi bands on boats and the smell of sweet corn and micheladas wafting passed us, we happily drifted off on our own boat down the canals and around the chinampas (pieces of land used for agriculture). 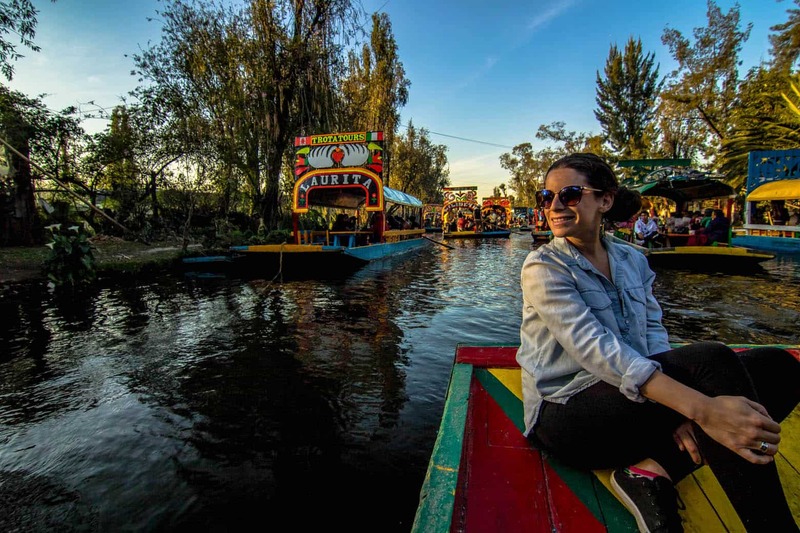 Switch things up on your 3 days in Mexico City with a boat ride in Xochimilco. We cracked open our beers and had ourselves a bit of a photo shoot and mini party. Every bit of this experience was worth it! I highly recommend this for your Mexico City itinerary, mostly because it’s so different to anything else you can do in the city. It’s not every day you get your own private boat to play on or pass by a creepy doll island. Oh, right, did I not mention the creepy doll island? Catch the boat from Embarcadero Nuevo Nativitas. We paid $350 pesos. It doesn’t matter how many people you have, you rent the boat not pay per person. The type of boat you want is the one with the tables and chairs (not the one with the benches along the sides). Depending on where you came from, you’re likely going to have to cross the bridge to get to these specific boats (opposite side of the market). Don’t listen to anyone who tries to sell you a ticket on the way to the boats or while you’re around the boats. Just get there and negotiate with a boat guide yourself. Don’t pay any attention to the people who try to tell you this area is closed because of a festival or whatever another lie they try to use. Just go! Bring your own booze and snacks! It would be fun to buy them there…if the prices weren’t so inflated. Low on time? Want to squish day one and two of this Mexico City itinerary together? Check this popular tour out so you don’t have FOMO and get everything you want! I felt like I walked a thousand miles today and probably inhaled an equal amount of calories too. Today, you’re roaming around Coyacan and the historic center of the city. Frieda! It’s me! Open up! While I mentioned museums aren’t really my thing, our friend Megan talked up the Frieda Kahlo museum so we tried to go, but unfortunately, we chose the exact day it was closed for some event (doh!). 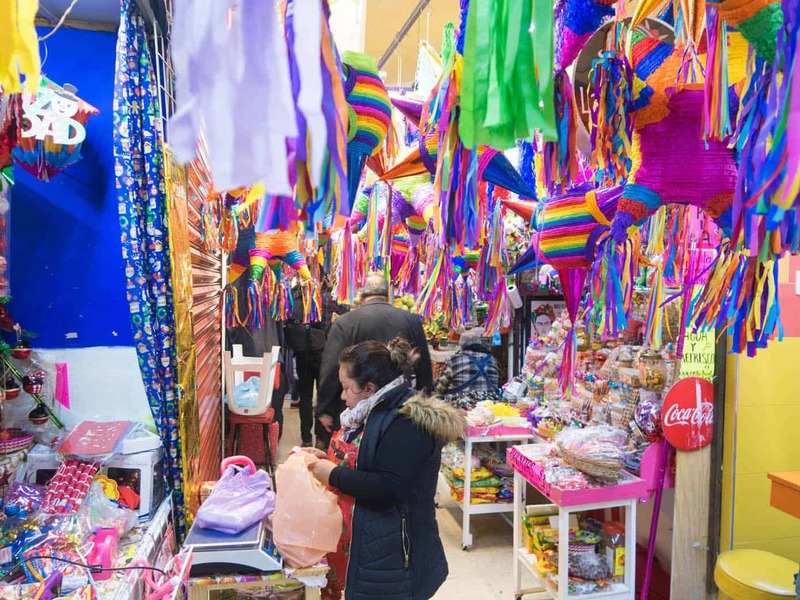 It didn’t stop us from peeking in, taking pictures outside its brightly washed blue walls, and meandering the area only to stumble on a crazy pinata market. I’m calling the Mercado Coyacan Market a pinata market because seriously, I’ve never seen so many pinatas in one place in my life! It was like a fiesta threw up all over this place. Go here for an in your face Mexican Market, full of food, things to buy (like 10-peso nail polish—it’s the best cheap nail polish I’ve ever bought), and of course, pinatas! Be sure to check out the fresh tortilla stall for a peek (and smell) at the process. Uh, yeah, what? I love animals…. don’t you? Wouldn’t you like to get some animal watching in? That’s what I thought! Coyacan is where it’s at for some great animal watching. First up, stroll around Parque Mexico where there’s an elaborate array of dogs. Everywhere. I have never had so much fun at a dog park without a dog in my life. All types of dogs, all types of characters, and hilarious humans trying to get their dog under control or at least not fall over when Guillermo the Great Dane jumps on them. 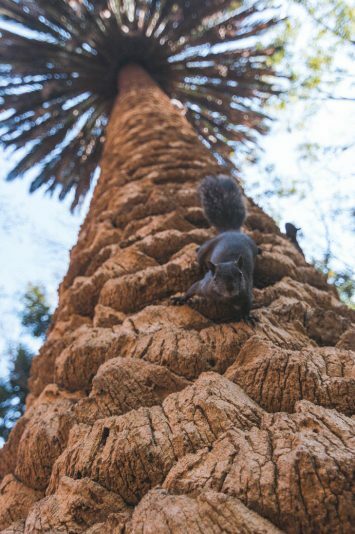 Oh, hello, Mr. Squirrel. Thanks for posing! After you get your puppy fix, you have to check out Garden Hidalgo. A cute peaceful area, with a few fountains, people chilling on benches, and the friendliest goshdarn squirrels you’ve ever met! I’ve never been able to get so close to a squirrel and I’m from Florida where we have TONS of squirrels roaming around. I mean, just look at the picture… How cute! We spent an embarrassingly long time here photographing these cuties. This just might be one of the prettiest buildings in the city! OK, so nearly the entire city looks good enough to throw into a history picture book but the center is something else. Especially the famous and super busy, Avenida Madero—the most popular street of them all. 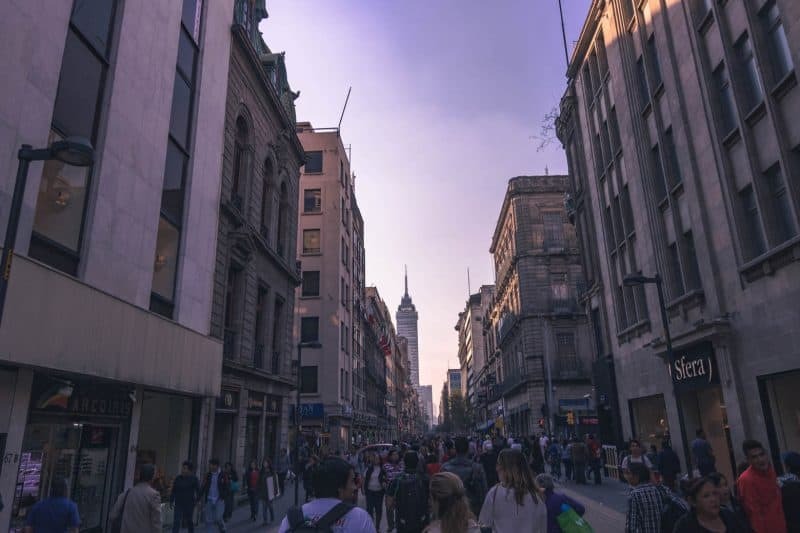 Avenida Madero is a walking only street full of boutique shops, restaurants, and plenty of historical buildings to admire. 3 days in Mexico City means lots of getting wonderfully lost down its historical streets. Going up down and around this street, you’ll bump into The Metropolitan Cathedral, the National Palace, the Latin America Building, and the Palacio De Bellas Artes. All works of art in their own way! We decided to end the day with a well-deserved beer on a rooftop for sunset. We tried the Latin America Building but found their price was pretty unreasonable. So we opted for the Terraza Catedral which charged nothing more than the beer in my hand. It turned out to be a fab choice (although not nearly as tall at the Latin America Building)! 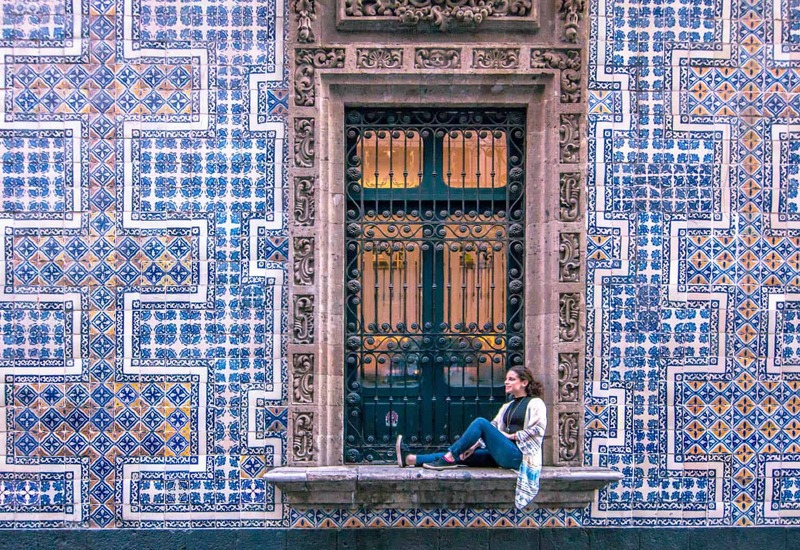 With your Mexico City itinerary being all about the city the 2 first days, you may want a break. 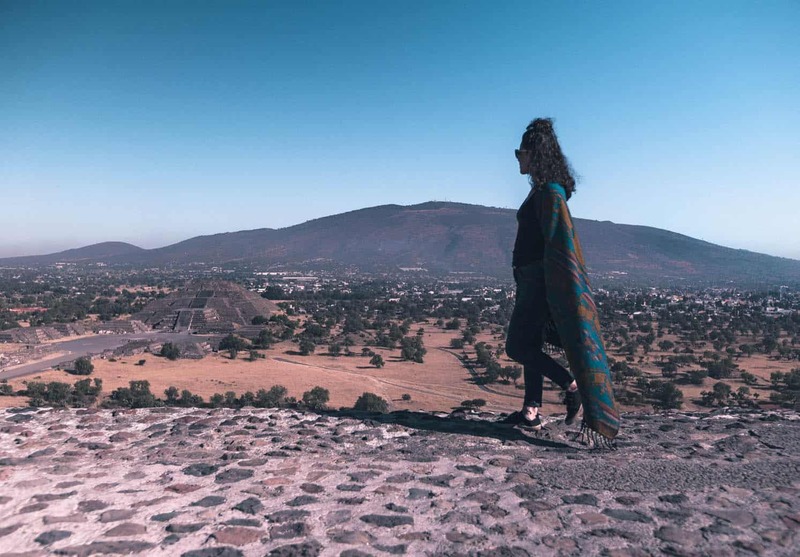 Teotihuacan is such an easy day trip out of Mexico City, it would be a shame to miss! We spent about half a day roaming these incredible ancient sites. A tour is 100% unnecessary. The biggest tip, and it’s no secret for most touristic places in the world, is to get there as early as possible. Fewer crowds and cooler weather are huge and important factors when visiting this attraction. We arrived at 8:30 am and we were able to complete the entire complex in under 4 hours. And that’s with taking lots of photos and video. Leave extra time if you want to wander the museum or shop a bit. 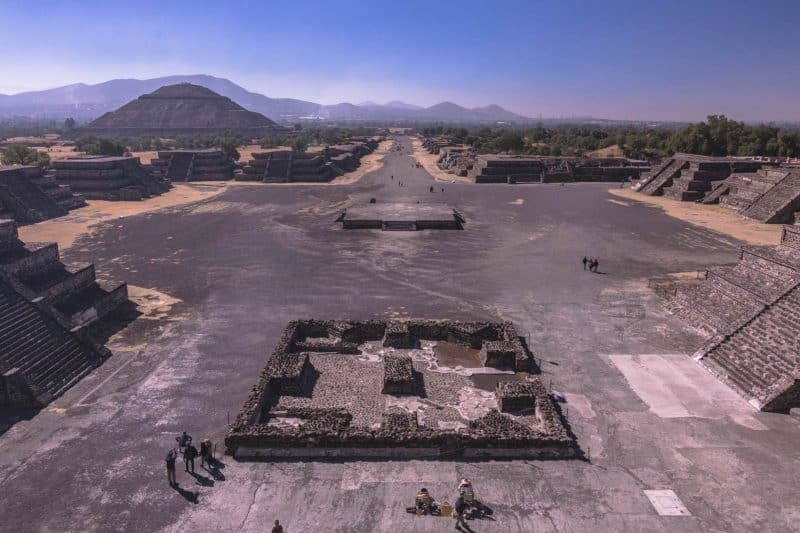 The view of the Pyramid of the Sun from the Pyramid of the Moon. The pyramids themselves are quite impressive. The best views of the pyramids are when you’re on top looking at the other. So the best Pyramids of the Sun views is when you’re on the Pyramid of the Moon and vice-versa. There’s also a third pyramid that’s still being excavated called Pyramid of the Feathered Serpent. Not as impressive as the main two but certainly still worth a visit as you can see snakeheads adorning the sides and take a peek at the workers digging out the massive and impressive structures! Simply go to the Northern bus station and walk to the bus stand all the way to the left. There’s a sign for Teotihuacan buses. Buy the round-trip ticket there, hop on, buy the entrance ticket to the pyramids and you’re good to go! The buses are running constantly. Sunscreen! I totally forgot but luckily was fine. Everyone else got a bit crispy. A hat, I never wear them but if your sensitive, it could be a good call. It’s super bright and there’s zero relief from the sun. Water, unless you enjoy paying for overpriced bottles of water. A snack, again, unless you enjoy overpaying. We were in the Roma Sur and Roma Norte area and found some truly yummy places to eat at with our 3 days in Mexico City. This place was recommended to Megan by an expat friend so we knew it was going to be good! 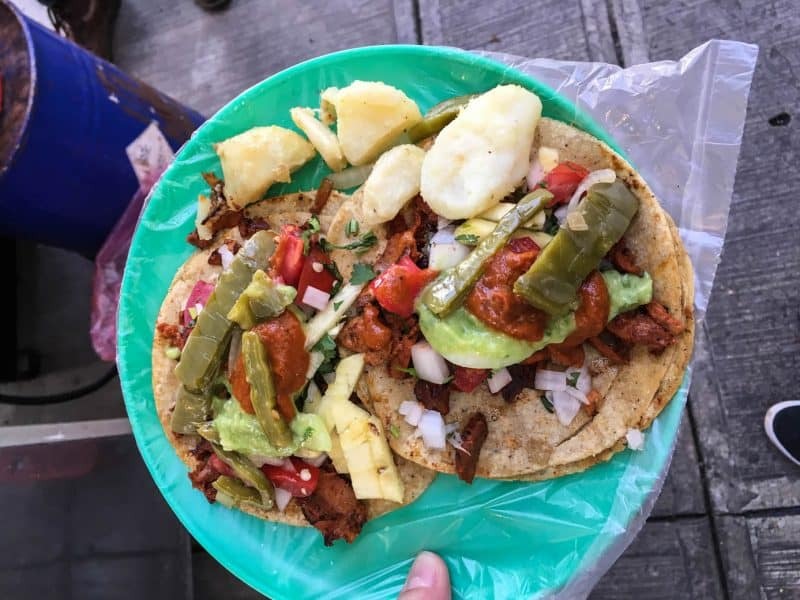 They are known for their tacos al pastor (it’s meat, not a priest), but we had a selection of items and only went home with full and happy tummies. Bless this place! I’m not much of a meat eater (in fact I’m 95% vegetarian) and this place was a blessing. A vegetarian taco stand! I was able to have soy-rizo (chorizo) and it was damn good! The taco stand offers all sorts of topping like nopales (cactus), salsas, beans etc to top it off. This place was the bomb and didn’t make us bloated full which sometimes happened after the heavier meat taco stands! What an awesome find! I’m an indecisive eater and often wants a bit of everything. This place is perfect if that’s you too! It has food from all over Latin America – Chile, Argentina, Brazil, Mexico, of course… and you can order bits and pieces of whatever you want from anywhere you want. There’s even a full bar at the back too. We had ceviche, cachapas (interesting sweet/savory crepe like thing) and some grilled veg (I needed some veggies in my life!) we also washed everything down with a nice local craft beer, does life get better?! For a real churro experience on your Mexico City itinerary, El Moro is apparently the place to go, so we heard! We tried it for ourselves and we can confirm. YUM! Churros and hot chocolate are a real winner but be careful. This treat is very filling and sugary! 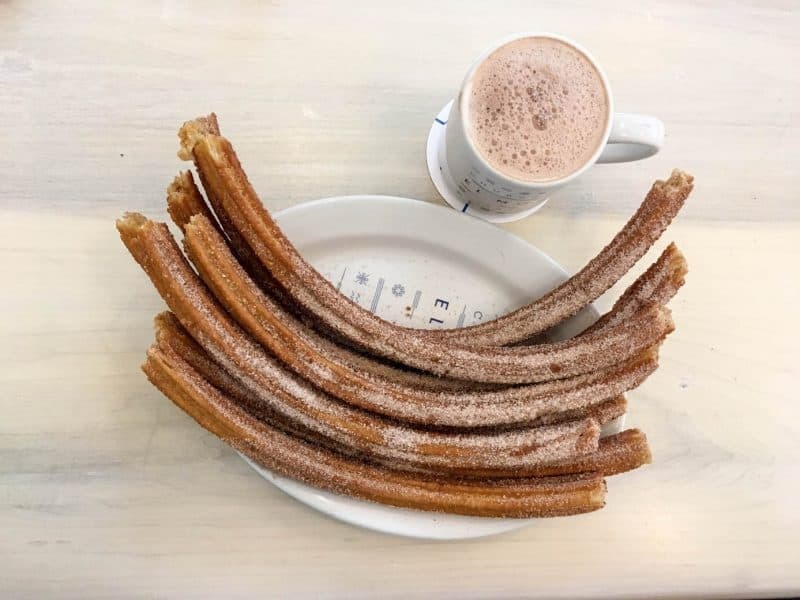 I think we ordered a bit too much, I’d recommending sharing the order of churros (4) and ordering more if you want more especially if you just had lunch. Either way, with 3 days in Mexico City, you need to have churros at least once. If food makes you happy and you love to experience the spots the locals eat at, try out a food tour in the city. 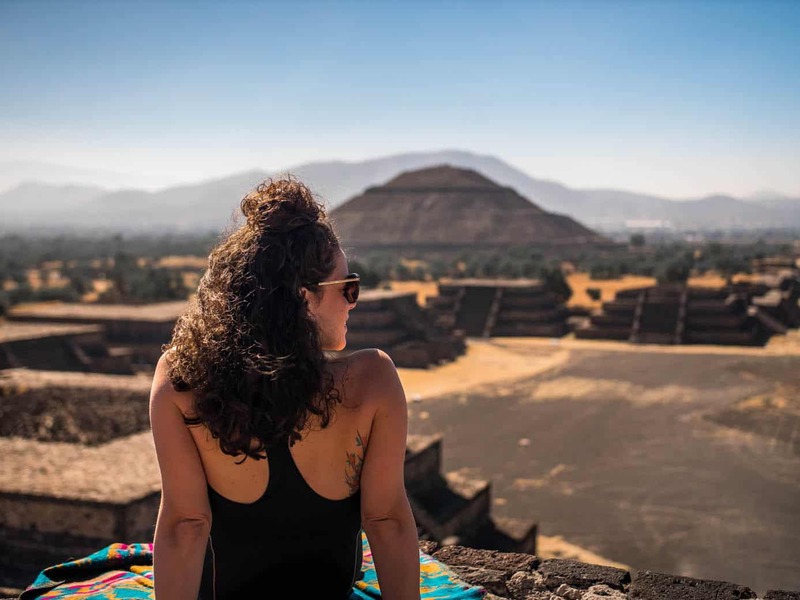 We didn’t have time to do any other day trips except Teotihuacan but there are some other excellent options should you have the time. These are on my “next time” list! I vote Airbnb! As per usual. We had a perfect spot in the Roma Sur area and really couldn’t have asked for much more. See what Airbnbs are available and grab a discount if it’s your first time signing up. 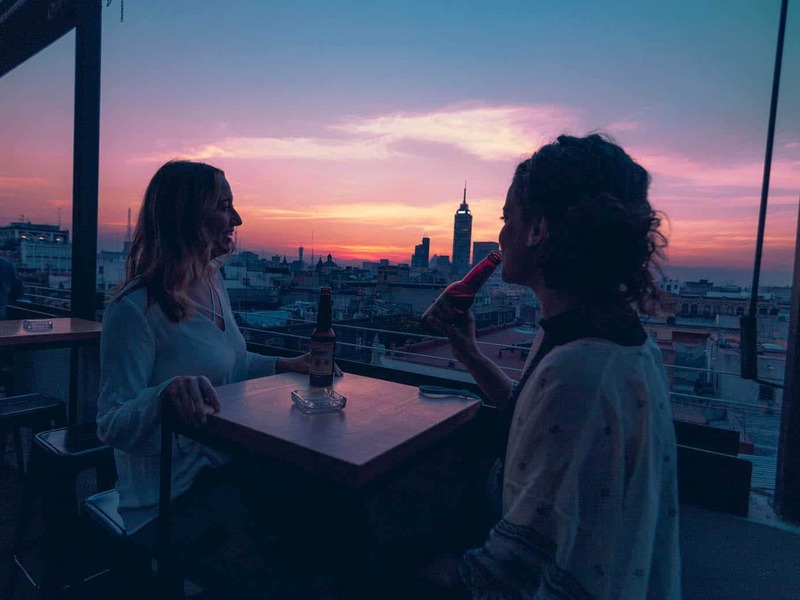 Colonia Roma, Sur, or La Condesa is where I recommend staying although there are plenty of cool and safe neighborhoods in Mexico City. If you’re not visting for very long, staying at a hotel near the airport is a great option. I have to say, I was pleasantly surprised with my 3 days in Mexico City and I’m sure you will be too. Big shout out to my friend’s Megan and Scott! 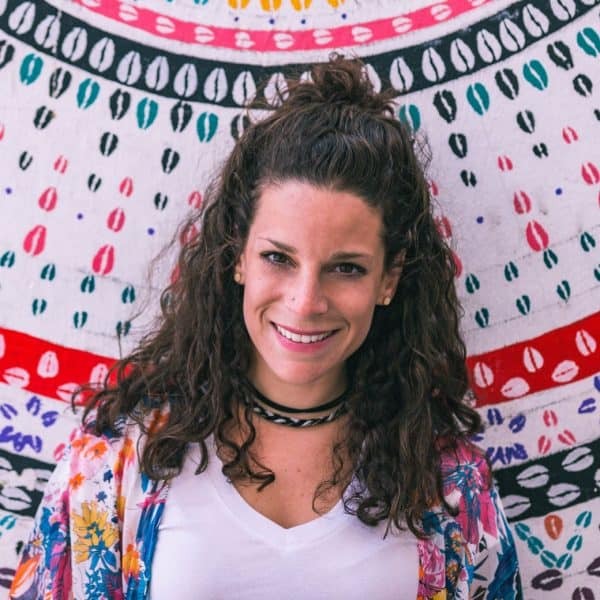 We were traveling around Mexico with them and Megan had all the deets on everything! When are you headed over? 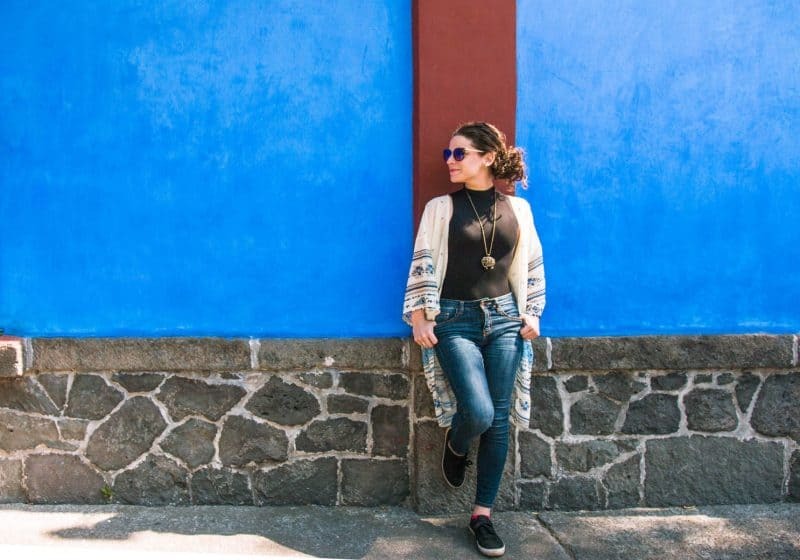 Did this Mexico City itinerary help? Let me know in the comments! Keep this for later! Click the picture and save it. Love your blog post. 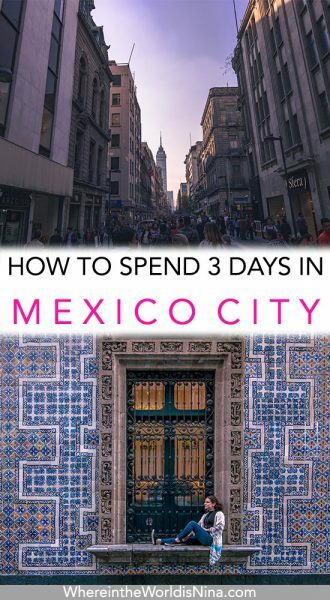 I’m visiting Mexico City in August and this was super helpful! On a side street off of the famous street in the city! Hi, Nina! This is an amazing guide! I`m impressed how much you can see and experience in just 3 days. Not to mention how magical Mexico City is- with all of the colors, smells and tastes it`s so easy to fall in love with. I was wondering, is there anything you wish you knew before taking this trip? Thank you! Not really. MC is pretty darn easy and chill! I didn’t think it would be but it was!